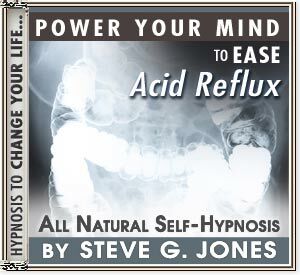 Power Your Mind naturally with Ease Acid Reflux Hypnosis! YOUR SUBCONSCIOUS MIND HOLDS THE KEY TO EASING ACID REFLUX, GASTRO-OESOPHAGEAL REFLUX DISEASE (GORD) AND OESOPHAGITIS FOR THOSE WHOSE SYMPTOMS ARE BROUGHT ON BY OTHER DIFFICULT ADDICTIONS AND LIFE CHOICES. Improving posture (see also our Maintain Good Posture Hypnosis CD or MP3 download). Acid reflux is a condition where stomach acid enters the esophagus. This creates a burning sensation in the chest and throat areas. If you suspect you have acid reflux, it is important for you to see your doctor so that you can be properly diagnosed. Remember, if you have any chest pain at all, it is important that you see your doctor immediately. There are many things that can cause or trigger acid reflux to occur. Acidic and fatty foods are most often the culprit of acid reflux. Also, the combination of a heavy meal and then lifting something, bending over, or lying down soon after eating, can trigger acid reflux. One way you can help control acid reflux and changing your diet. Foods that are acidic, fatty, or spicy usually trigger acid reflux, but it is important for you to find out which foods are triggering it for you. Even healthy foods such as tomatoes, citrus, and peppermints can trigger acid reflux. It is important that you find ways in which you can control or ease acid reflux.